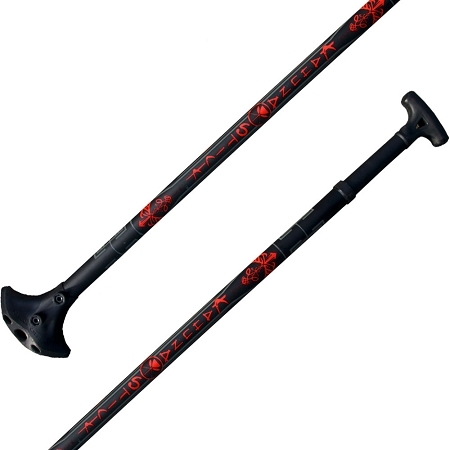 The Adjustable Kahuna Big Stick comes with an adjustable black aluminum shaft, which allows riders to change the size by simply pushing in a pin and adjusting the length. This Kahuna Big Stick features our completely unique, brand-new soft grip that makes riding unbelievably comfortable. Featured on bottom of the Adjustable Big Stick is the Kahuna Blade™. - Vulcanized rubber road grip is the rubber that meets the road. The Kahuna Creations’ R&D team analyzed the entire stroke path to insure the ride is comfortable, powerful, and smooth. The undulated shape of the Kahuna Blade provides proper leverage at each contact point through the entire stroke path. Dampening holes are included to take out weight and deliver the sweetest-feeling stroke possible. We love this new product from Kahuna Creations and we're sure you will too! Height Range: 4'5" to 6'4"